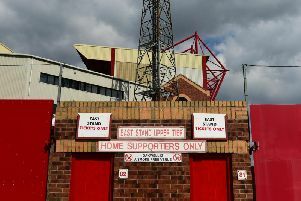 An injury to Bobby Grant marred last night’s 2-2 draw at Blackburn Rovers which Fleetwood Town head coach Uwe Rosler dubbed a result that felt like a victory, writes ROSIE SWARBRICK. Fleetwood twice bounced back in the second half to earn a point at Ewood Park. Bradley Dack gave Rovers the lead after they punished Town loanee Aiden O’Neill for giving away possession. O’Neill then recovered to grab a goal 12 minutes after Dack’s 52nd minute opener. That was before Rovers’ Joe Nuttall marked his first appearance off the bench with a debut goal in the 77th minute for Tony Mowbray’s side. However, Town’s late goals continued to flow as Wes Burns ended his 19-month drought to bundle home George Glendon’s corner seven minutes from time. Speaking about Grant Rosler said: “I don’t know (how it happened). “At half-time he did not look good, he is on crutches and that tells you a lot. “I think, first half, the game was like we expected. “Blackburn had a lot of the ball, our shape and our determination and our grit kept us well in the game. “I don’t think they created a lot of chances. I would have liked us to counter in that period a little bit better but in general I was happy. “Young Aiden O’Neill did really well until the square ball; against such an experienced team like Blackburn they punish you with that. “After that I felt we were clearly the better team; we took over and passed the ball really well. “We had 12 attempts, they had 11, we had seven on target, they had four.